Porphyry pavers, both cut tiles and 8/10cm cubes, were used in this park on the island of Malta. This was a new project designed be Architect Anne Casha working with the Malta Environment & Public Authority who decided to provide its people with a new park, creating it out of a rocky area along the coast. Porphyry was used to create a fresh relaxing space for families which is also ideal for strolls and admiring the waves crashing along the coast. The project used 8/10 cubes and split tiles to bring out the very best in the area and give it some color which is brought out even more by the splendid sunlight on the island. 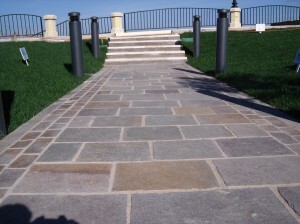 Porphyry made it possible to create real pedestrian walkways which are safe and resistant – over time – to both the sea salt and the high temperatures marking out the islands of the Maltese archipelago. The park, an area of 6,500 square meters, is in the Maltese town of Sliema and along one of the most popular beaches known as “Qui-Si- Sana”. Play areas, public services, green areas, pedestrian areas and a car park are just some of the opportunities offered by this park. The project was installed by local firm Schembri Barbros Ltd. Founded over 50 years ago by Joseph Schembri. Barbros Group has since established itself as a major player in the Maltese construction industry by having a key role in such projects as Valletta’s Merchants Street, the Cottonera Waterfront, the original Farsons Brewery, as well as a number of factories and arterial roads. A mainstay of the Maltese construction industry for over 50 years, Barbros Group is a self-sufficient family company that continues to be instrumental in the shaping of Malta’s urban landscape. Sliema is an important tourist location located on the northeast coast of Malta known for it’s beaches and clear deep sea. It is a center for shopping, restaurants and café life. Tas-Sliema is also a major commercial and residential area and houses several quality hotels. Tas-Sliema, which means ‘peace, comfort’, was once a quiet fishing village on the peninsula. Tas-Sliema and the coastline up to neighboring St. Julian’s constitutes Malta’s main coastal resort. Malta is a group of seven islands in the Mediterranean Sea. Only the three largest islands – Malta, Gozo and Comino – are inhabited. The terrain is low and rocky with coastal cliffs. Malta, in the heart of the Mediterranean, is a melting pot of civilizations with a history stretching back thousands of years. The country has been inhabited since around 5200 BC and a significant prehistoric civilization existed on the islands prior to the arrival of the Phoenicians who named the main island Malat , meaning safe haven. Later the islands were for centuries the seat of the Order of Knights of the Hospital of St John and then part of the British Empire.Malta became independent in 1964.